I never buy gluten-free bread. There are two reasons for that. One, I haven’t found a gluten-free bread that is free of tree nuts, eggs, and tapioca. Almost all gluten-free breads available on the market contain one of those ingredients. Oh wait, I did find a gluten-free bread that was free of all those things. It was this Gluten Free Omega Flax Bread by Silver Hills Sprouted Bakery. It was wonderful and delicious. But then, my stomach stopped liking it. The bread started hurting my belly, big time. And that is when I concluded that I’m “allergic” to chia seeds. I use that “allergic” word carefully, as I do not know if I have a true IgE allergy to chia seeds. I do know that they kill my stomach and give me almost unbearable abdominal pain. Which means, I WILL NEVER EAT THEM. EVER. This also means that there’s no store bought gluten-free bread that will make my belly smile. If I want gluten-free bread in the house, I make it myself. I have this gluten-free teff bread recipe up on the blog, which is wonderful, but it’s not necessarily conducive for packing a PB&J sandwich in your second grader’s BPA free lunch can. I have also experimented with making a sprouted buckwheat and red lentil bread, which you can see here on Instagram. That bread was eaten plain, or with vegan butter, and the entire loaf was finished in twenty-four hours. But it might have worked for PB&J!? Speaking of the vegan butter, I know that technically it is a processed food. I’m not too worried about that since processed food isn’t in my regular day-to-day diet, and I don’t even eat the vegan butter very much. After being strictly dairy-free for so many years, which now I’m not strictly dairy-free, re-tasting cow butter makes me pucker a little. I do not really like the taste of it. I’ll spare you the details of how I think it really tastes. Actually, I won’t. The way cow butts smell at the dairy farm? That’s how cow butter tastes. My girls are gluten-free, but not strictly gluten-free. They get the occasional waffle cone at Molly Moon’s and regular birthday cake at a party (because the gluten-free option has TAPIOCA, can you believe it!?). Although, I’m still recovering from when the Wendy’s Eating Husband took my girls to East Coast Enzo’s for regular gluten-filled pizza while I was out of town in mid September. I might have been a little mad about that. I try to keep the mainstay of the girls’ diet gluten-free because they have a genetic marker for celiac disease. (I also semi-fear them having as messed up of a gut as I have now.) As a naturopathic physician, if someone is heterozygous for a celiac disease gene, I recommend that they are gluten-free most of the time. If someone is homozygous for a celiac disease gene, I recommend that they are gluten-free 100% of the time. The girls are heterozygous for one of the genes, I am heterozygous for two different celiac disease genes, and the Wendy’s Eating Husband is homozygous for one of the genes. Homozygous meaning that he has a double copy of it. What all of this really means is that my kids do not eat PB&J on Dave’s Killer Bread for lunch, like the Wendy’s Eating Husband does. I torture my children with raw collard greens instead. 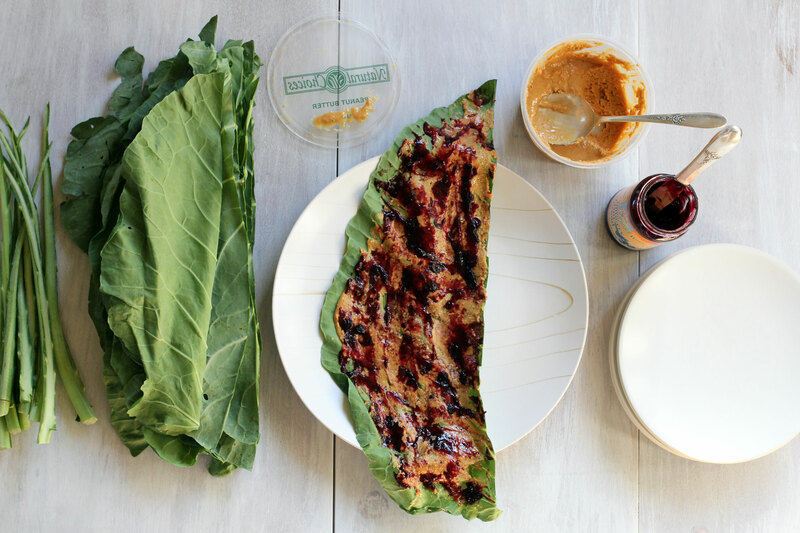 Actually, my kids love Peanut Butter & Jelly Collard Roll-Ups, except the day I photographed them. On that day, my younger one informed me that she doesn’t like them anymore. Maybe I gave her too many? I’m not that big of a fan of regular peanut butter and jelly, even though that was my school lunch mainstay as a kid. Boy, is it delicious. I view a peanut butter and jelly sandwich on Dave’s Killer Bread more like a dessert, due to all the carbs. Now I’m going to pick on the jelly. 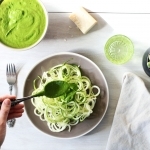 I’m not a fan of jelly, but I will let it slide if it’s eaten on a raw vegetable. I can deal with that. 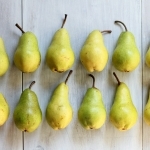 For the healthiest jelly, choose one free of white sugar (even if the white sugar is organic). I recommend fruit sweetened jellies made with high antioxidant fruits such as blueberry, bilberry, or elderberry. What you see in the picture is bilberry jelly (bilberries are AMAZING for your eyes!). 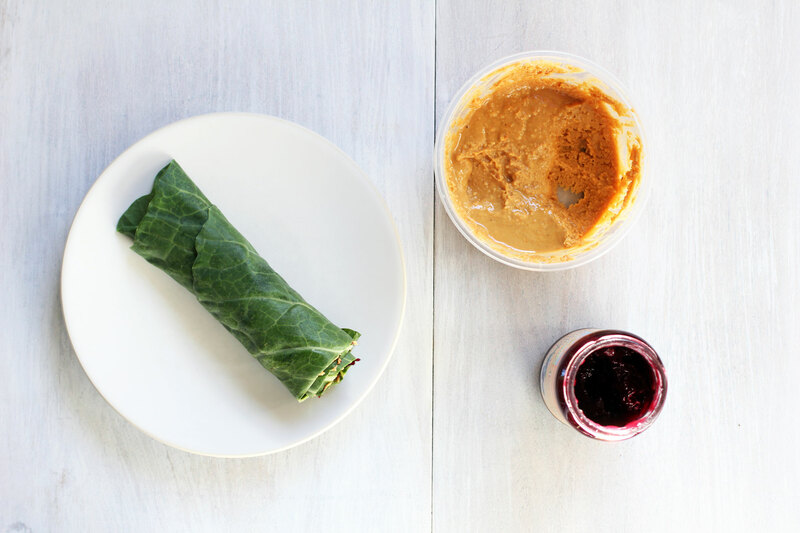 I prefer to use fresh ground peanut butter in our PB&J Collard Roll-Ups because it’s thicker, which means less ooey gooey squeezing out the ends. 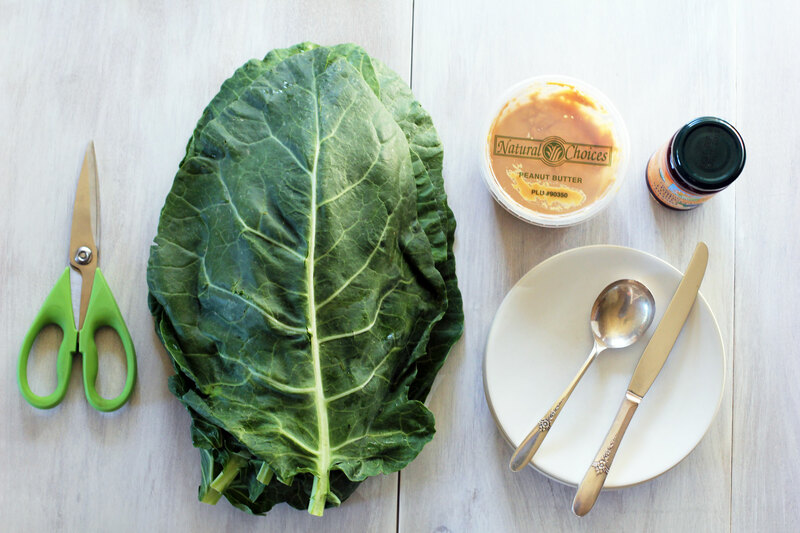 I store the cut and washed collard leaves, rolled up together in a bundle, in a gallon Ziploc bag or Gladware container in the fridge. Sometimes I’ll wrap a paper towel around them to protect them from moisture. The fabulous thing about the collard leaves is that they soften as the days pass. I prefer using the collard leaves as wraps after they’ve been cut off their stems for a few days. They’re much more pliable and tender that way. 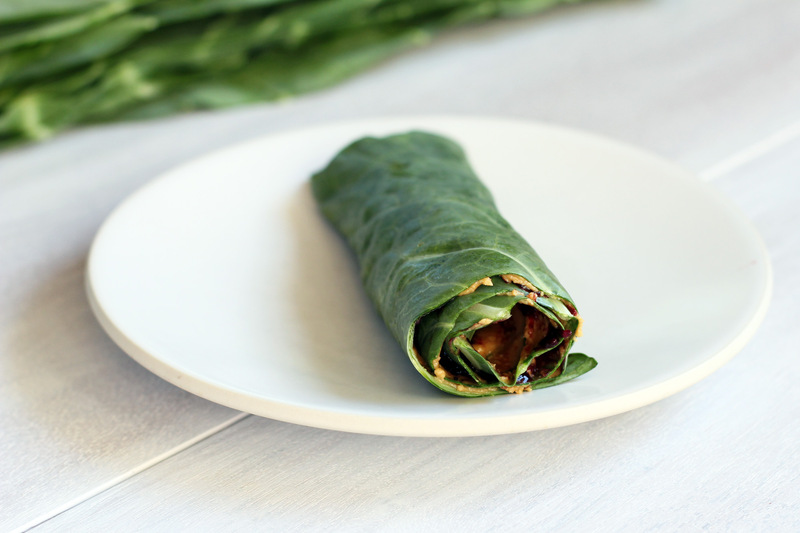 Having these collard green wraps ready to go in the fridge has been a lifesaver for me in many ways! I make sandwiches with them on the daily!